Sushi Bar – The Rules! Hey! Why are you eating like a Gaijin at the sushi bar?!? If you are in America at one of those Chinese owned Chinese/Japanese restaurants, then no one is going to care how you eat at their establishment. But if you are in a real sushi bar, or even better, one in Japan, you had better know the rules and customs or you may look like an idiot and insult your hosts. Japan is a land of customs and traditions so you should at least know the basics before invading their sacred territories. Let’s hit rewind and talk about how to do sushi the right way. You find a nice sushi bar and walk in. The first bit of business is on you. Look around and take notice of how clean and maintained the establishment is. If it is not up to your standards, looks run down or dirty, leave immediately. Raw fish is not something you should take your chances with; unless, of course, you enjoy spending a LOT of time in the bathroom or a hospital emergency room. If the restaurant cannot maintain basic outward appearances, then they will definitely be cutting corners in regard to food purchasing, preparation and handling. In traditional Japanese establishments, the host/hostess will bring you a hot, moist towel. This is not bath time folks. Use it to clean your hands and place it immediately back in the wooden basket/ceramic plate/next to your place setting. No matter how tempting it is to keep it for later, you will be looked at bizarrely by everyone around you. It is important to note that clean hands are important because you will be handling super fresh food with delicate flavors with them. One would not want to flavor a piece of sushi with whatever you touched last (We all know you just came from the bathroom too). When sitting at the sushi bar, there are two people that you order specific parts of your meal from. Any drinks, soups, salads and/or non-sushi items are ordered from your server. All sushi items are ordered through the sushi chef. This seems straight forward enough, but it is an important distinction to understand. The sushi chef does not/should not be disturbed from their work. They are using surgically sharp knives, handling delicate sea food that should never be cross-contaminated and generally should not be bothered with other restaurant functions that can break their concentration. As far as ordering, you can order off of the menu or you can let the chef create a meal for you. While menu items are great solid choices for the novice sushi diner, the best sushi meals I have ever had were random creations from my sushi chef. Preparing your dipping sauce . . . in the small bowl put in a small piece of wasabi (to taste) and then pour in some soy sauce. Do not fill the bowl all the way up or put in so much wasabi that it looks like wasabi-mud. Or you can just add a dot of wasabi to your fish. This flavoring sauce or straight wasabi should be used very sparingly just to add an accented flavor to your sushi not to overpower it. Sashimi: Raw fish slices. This is the simplest form of sushi and you should enjoy the delicate flavors and difference between the types of seafood. This is the perfect type to use your wasabi-soy dipping sauce on. Nigirizushi: (a.k.a. – Nigiri Sushi) This is the prototype sushi. It is the cut piece of fish on top of a small pillow of flavored sushi rice. It sometimes has a small band of seaweed wrap (Nori). This can be dipped in the dipping sauce – fish side ONLY! Makizushi: (a.k.a. – Maki Sushi) These are your basic and not so basic sushi rolls. The traditional rolls have long slices of seafood or vegetables in the center surrounded by rice and wrapped in the Nori seaweed wrap. In the United States these rolls get a LOT more elaborate. It would be acceptable to dip the traditional ones into the dipping sauce, but less so the modern versions. The rule of thumb here is, if the sushi chef prepares a roll with its own sauce or unique flavoring, it would be highly insulting to alter the flavor that is presented to you with the soy-wasabi dipping sauce. What to drink? What to drink? Traditionally, acceptable drinks are water, green tea and/or sake. (TIP: To find out more about the various forms and quality of sake, see: http://www.sake-world.com/html/types-of-sake.html or http://www.esake.com/Knowledge/Types/types.html) Recently, beer has become acceptable as well. Any other drinks are believed to interfere with your palate’s ability to discern sushi’s delicate flavors. 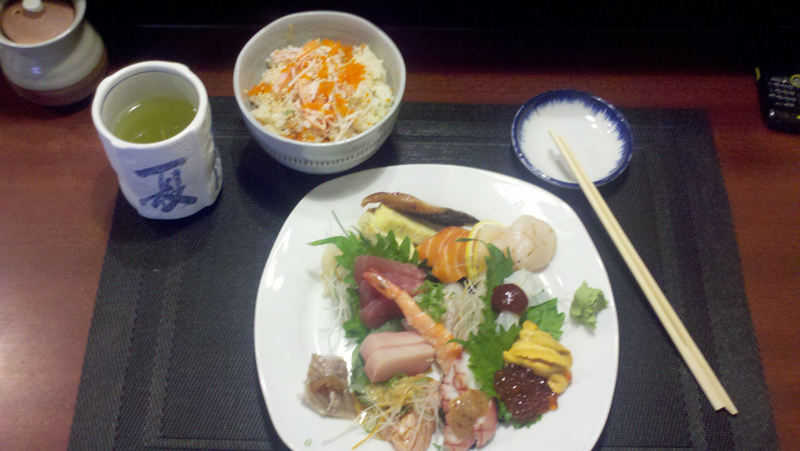 Sushi place setting with meal. Now that you have ordered your sushi, believe it or not, there is etiquette around actually eating it. If you have a platter or are sharing sushi with other people and want to pass a piece of sushi to another person, use the back end of your chopsticks; NEVER with the part you eat with. Sushi is generally created to be eaten in one bite to get all of the flavors that the chef intended for you to taste, so it is acceptable to cram a whole piece in your mouth. There are some exceptions; Temaki rolls are meant to be more than one bite. Also, there are monster sized rolls called Futomaki which I believe are created as a dare to shove all in your mouth in one shot . . . but good luck there. I have personally, and have seen some Japanese sushi eaters do this, but it is not a pleasant experience. 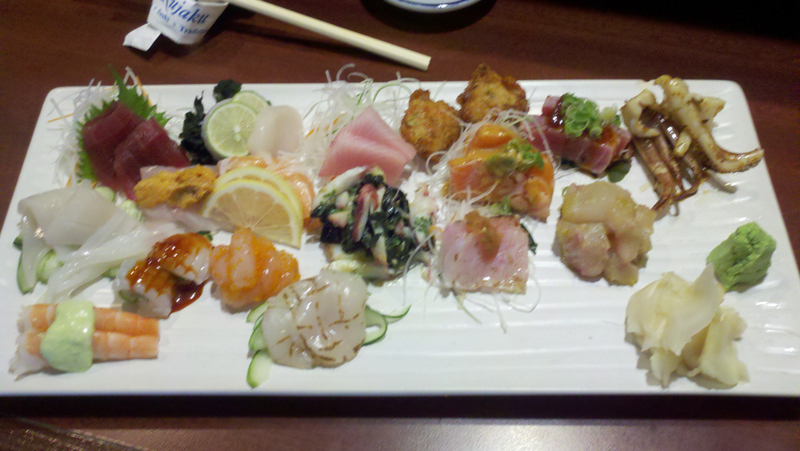 Another note on eating sushi is not to plow through an entire arrangement in one shot. Sushi has delicate flavors and subtle nuances. One should eat each piece taking in its unique flavors. In between bites, have a piece of your pickled ginger (which is provided next to the wasabi on your plate) and then a sip of your accepted beverage to cleanse the palate. Avoid trying other types of food before or during your sushi meal or all you will taste is a fishy mush. I guarantee you will enjoy your sushi to its fullest if you follow these steps. Not full yet, or want to try something that has caught your eye? It is 100% encouraged to order additional items from the sushi chef. It is a tremendous compliment on their skills. Another reason to order something else is that portion size outside of the United States is smaller. Had your fill? Excellent! Did you eat all of your rice? You had better!!! It is an insult to your host to leave even a grain of rice on your plate. Japanese warriors, in ancient times, were paid with rice. To this day, rice is a sacred staple in Japan. To leave rice shows that you are arrogantly wealthy and wasteful. It is in stark disregard to others who are not as fortunate as you are. So, now that you are done, who do you pay? As with ordering, you should always pay the bill with the wait staff, but never the sushi chef. The chef considers what he/she does an art form and money dirties his/her work. The wait staff will go talk to the sushi chef directly and tally up what you have ordered and then bring you the bill. Tipping . . . in Japan, NEVER. It is considered offensive and takes away from the service that they take great care in providing. Elsewhere in the world, you should always look up what is accepted in each place you are traveling to. A great info-graphic on this can be found on this site (http://www.mint.com/blog/goals/tipping-abroad-03022011/). Another good resource for this is on this one (http://www.cntraveler.com/travel-tips/travel-etiquette/2008/12/Etiquette-101-Tipping-Guide). Now that the bill is settled up, make sure you perform the customary bow to your sushi chef, especially if the food was outstanding. Also, do not forget to bow to your wait staff as well as the host/hostess on your way out. If you want to attempt to add in some basic Japanese expressions, you could say: Thank you – Arigatō (Ardei ga-toe) and Good bye – Sayōnara (Sa-yo-na-ra). As you can see, the Japanese culture is steeped in tradition. Nothing expresses a society’s customs more than its culinary history and traditions. Sushi is the quintessential expression of Japanese pride and history. If you respect their way of life, even something as trivial seeming as food, you will earn their respect and bring honor to your name. Not bad, now you can pass for someone who is in-the-know when it comes to sushi etiquette! Go out and enjoy the benefits of your new found knowledge.